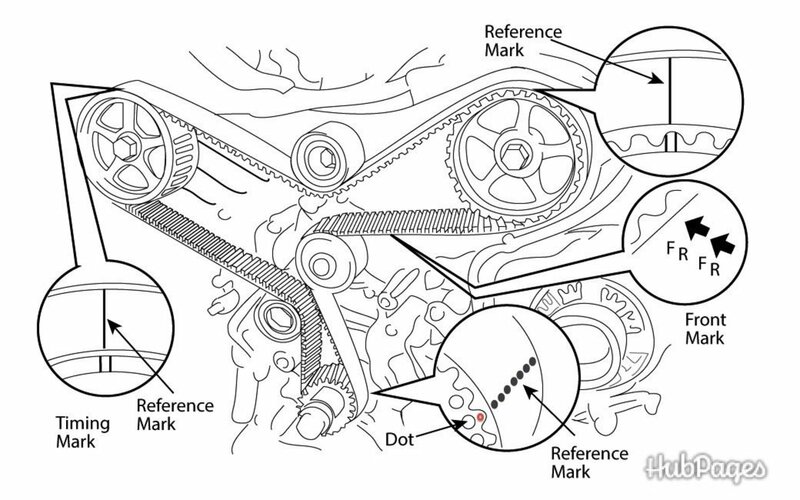 A common wear item on the '97–'01 Toyota Camry is the front suspension strut mount (referred to as a "suspension support" in the diagram below). 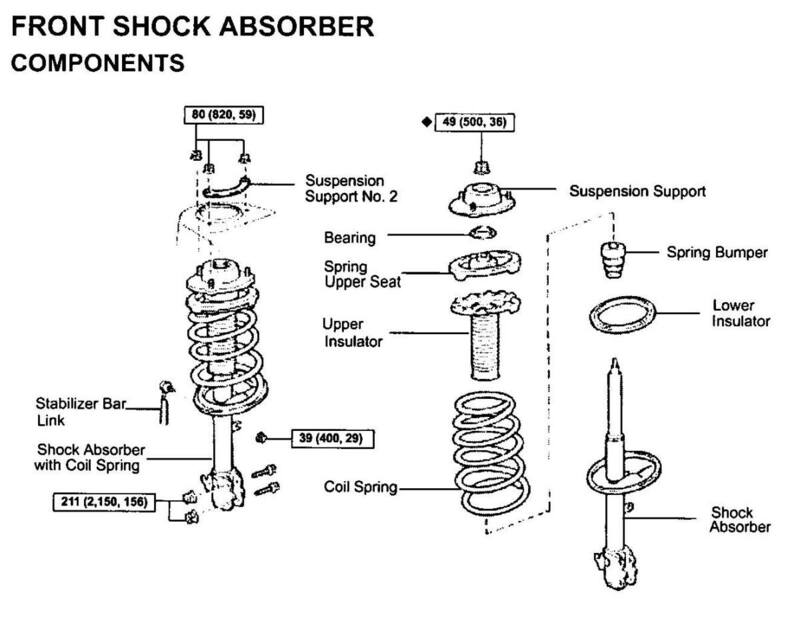 A rubber vibration dampener within the strut mount has a tendency to separate from the interior metal casing of the strut mount assembly. This separation causes the strut mount bearing to shake when the Camry is driven over rough road surfaces, resulting in a constant rattling noise in the front end. The noise may be less noticeable in summer than in winter due to the rubber expanding and contracting with temperature. 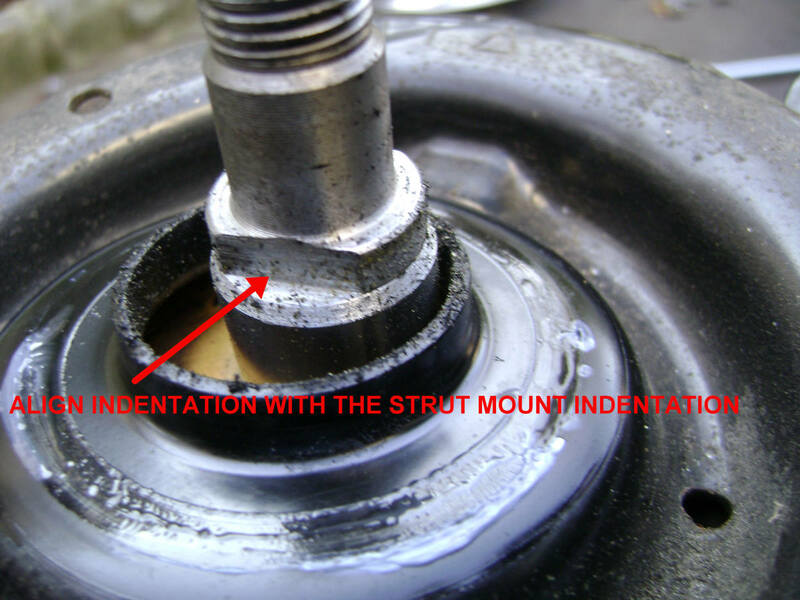 There are usually no visible indications of strut mount wear, only noise. However, on some very worn-out mounts, you can wiggle the rubber dampener within the mount's metal frame when you take it off the strut assembly. When you have a rattling noise in the front end, many automotive repair facilities will recommend replacing the strut/shock assembly without replacing the strut mount (perhaps because a new mount costs almost as much as a new strut). But replacing the strut assembly alone can result in an expensive repair job that doesn't get rid of the noise. Approximately half the mounts I've replaced were on struts that were still performing well; on the other half, the struts also needed replacement. Another source of front-end noise is worn or broken lower control arm bushings. Most Camrys with over 150k miles begin showing signs of wear or cracks in these bushings. A lot of the wear may be attributed to the harshness of the road surface where the car has been driven. 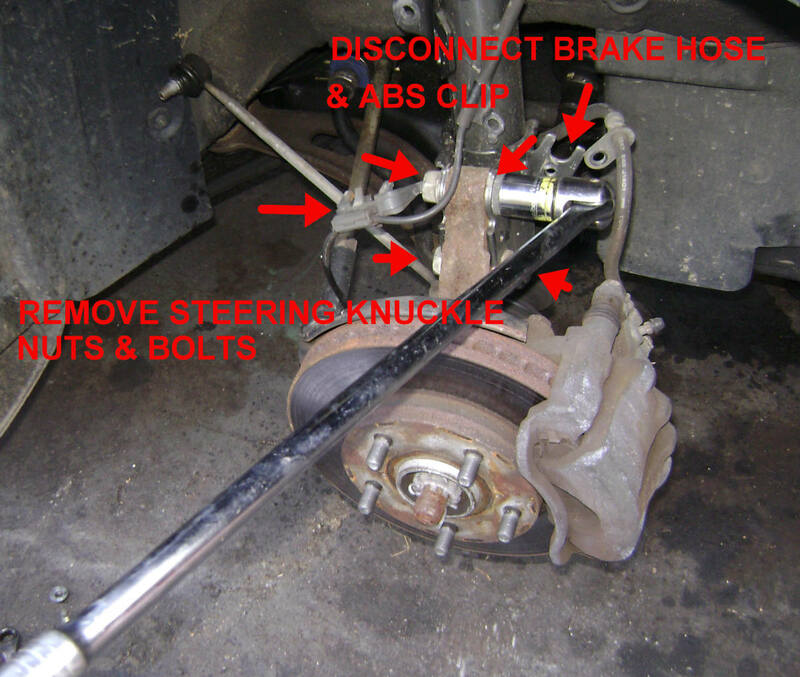 A link to a DIY video to replace the lower control arm is provided at the end of this article. See my other article on replacing the rear struts and springs on the '97–'01 Camry and similar vehicles. 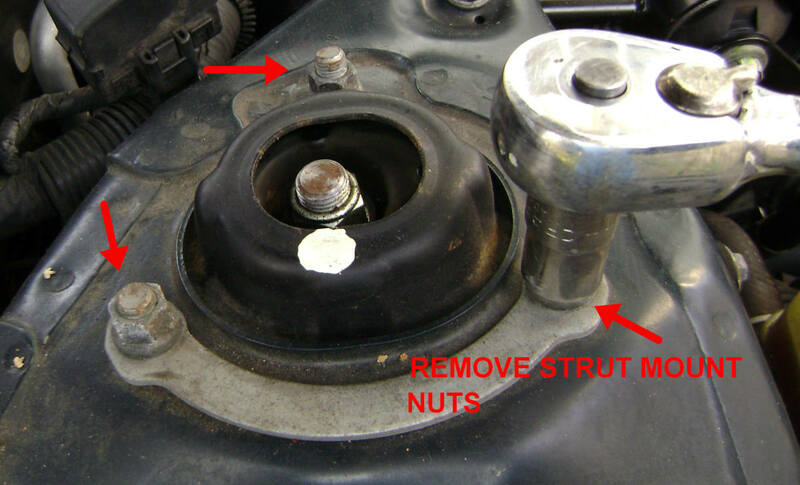 To replace the strut mount, you have to remove the strut assembly from the car and compress the strut springs, to relieve tension on the strut mount which is held together by the strut stem nut. 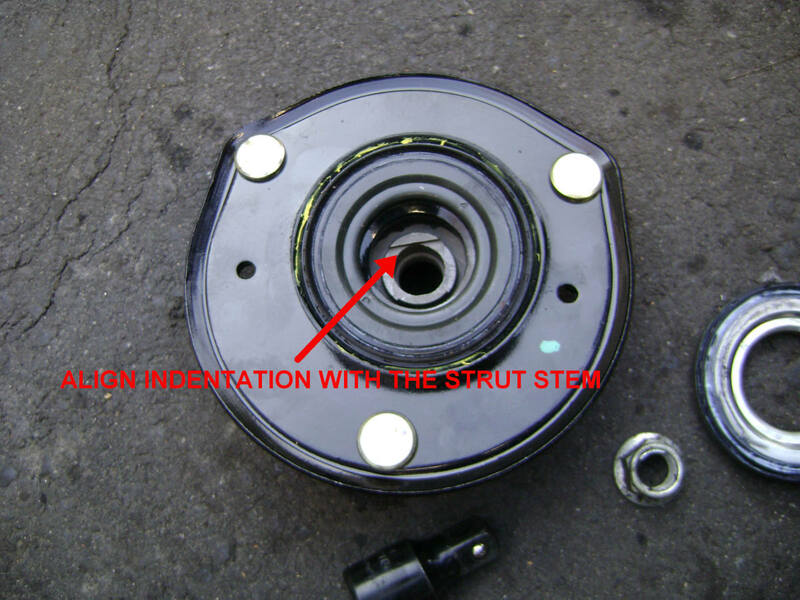 If you own a high-mileage Camry, consider replacing your old struts with the defective strut mount. However, as previously mentioned, I have replaced many strut mounts on strut assemblies that continued to provide good dampening and rebound action. The cost of a mount with a new bearing can vary from $25 to $100. I haven't had any customer complaints with the $25 units bought from eBay vendors. 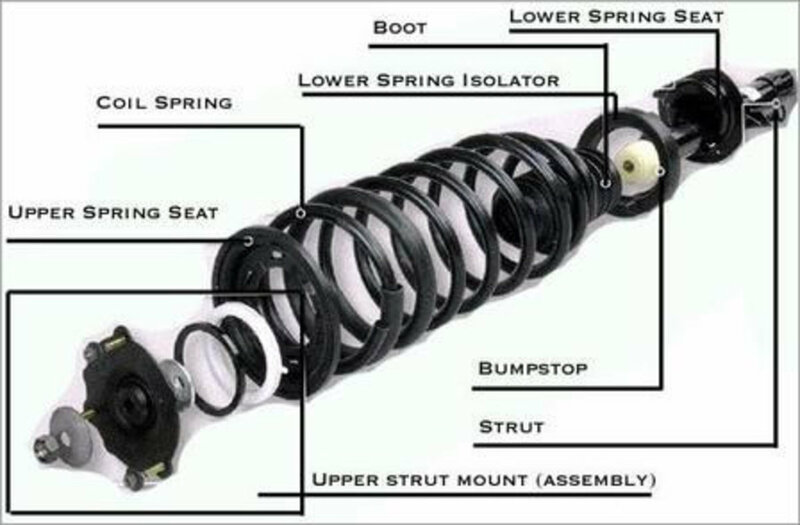 If you decide to replace the old strut when replacing the mount, consider replacing the lower spring insulator, strut bellows, and spring bumper as well. You can keep the existing upper insulator and reuse it. Use a razor to cut away the bellows component from the insulator and replace it with a new bellows that "floats" on the strut stem. Also, inspect the sway bar link. A worn-out or loose link can also be a major source of front end noise when driving over rough road surfaces. A new suspension strut costs from $40 to $75. Cross-reference prices and shipping costs for the best deal. If you want Japanese replacement struts, shop for either KYB or Tokico. Acceptable domestic manufacturers include Monroe and Gabriel (though I had an issue recently with Monroe struts). You can find no-name brands on eBay. Both names in each row mean the same thing. 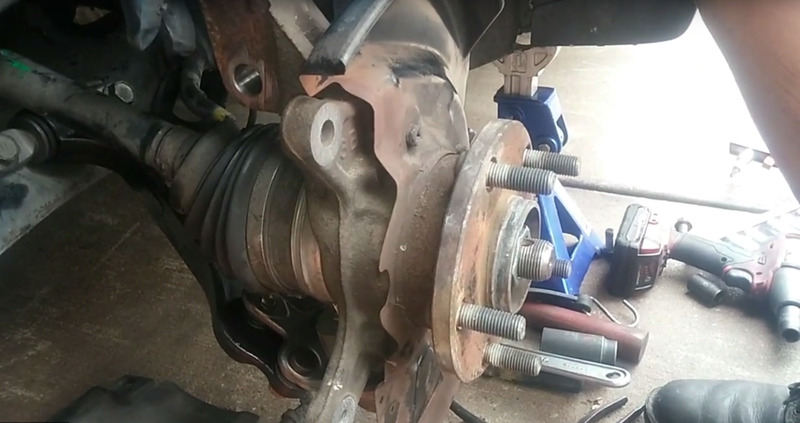 This 24-minute video will provide you with visual step-by-step help for completing the replacement of front suspension components used on a 2002 Toyota Avalon. These components are virtually identical to parts used on the Camry and Solara. The struts replaced here are "complete struts," where no parts were transferred and used from the old struts. The repair steps are also described lower down in the article. 1. 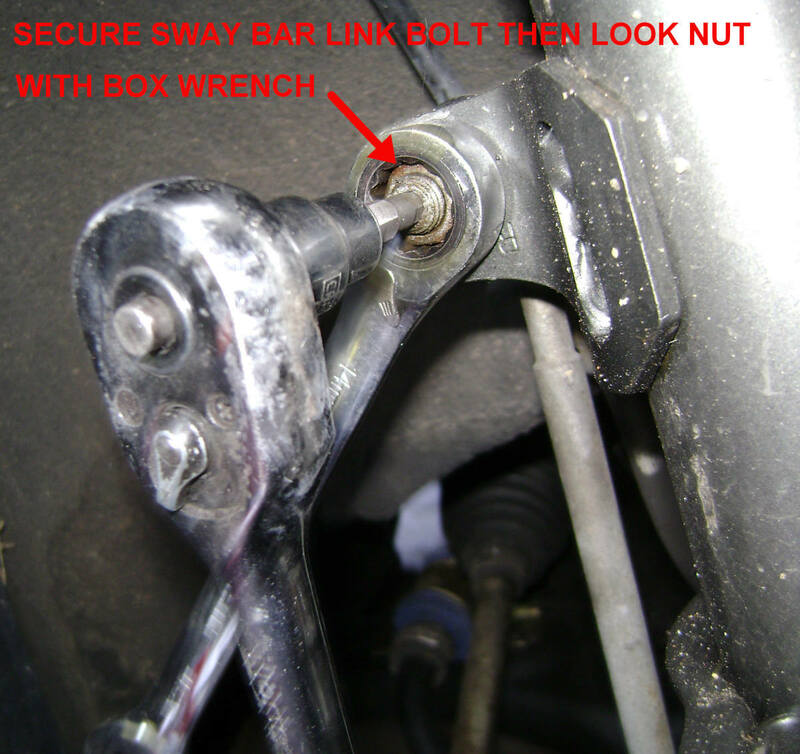 Wire-brush the nut and bolt on the sway bar link, then apply penetrating oil. 2. Secure the nut with a 14mm box wrench and relieve initial tension. 3. Meanwhile, while loosening the nut, prevent the sway bar link bolt from moving with a 5 mm hex socket. The hex socket is shown in the second photo below. 4. 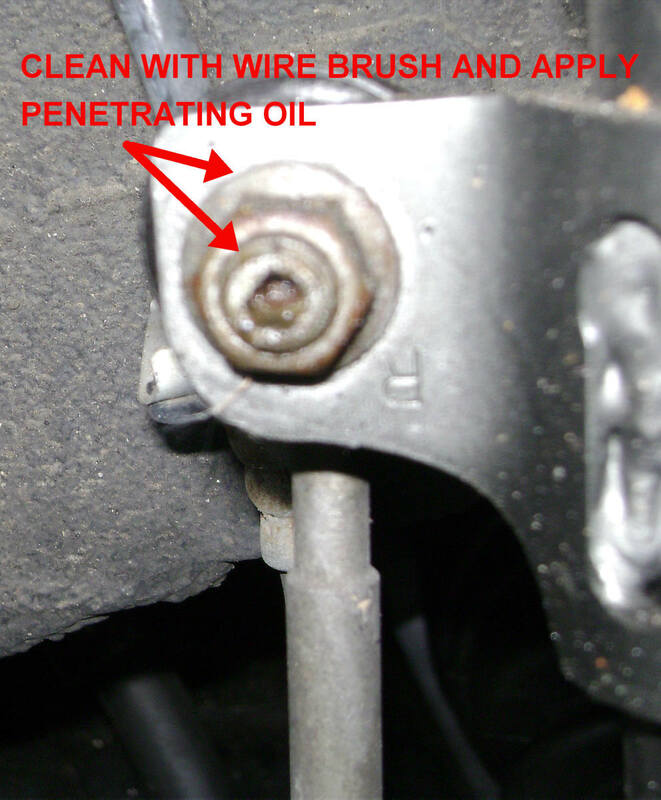 If the nut freezes up or becomes too difficult to turn, apply penetrating oil, re-tighten the nut and then loosen. Continue doing this until the nut spins off. 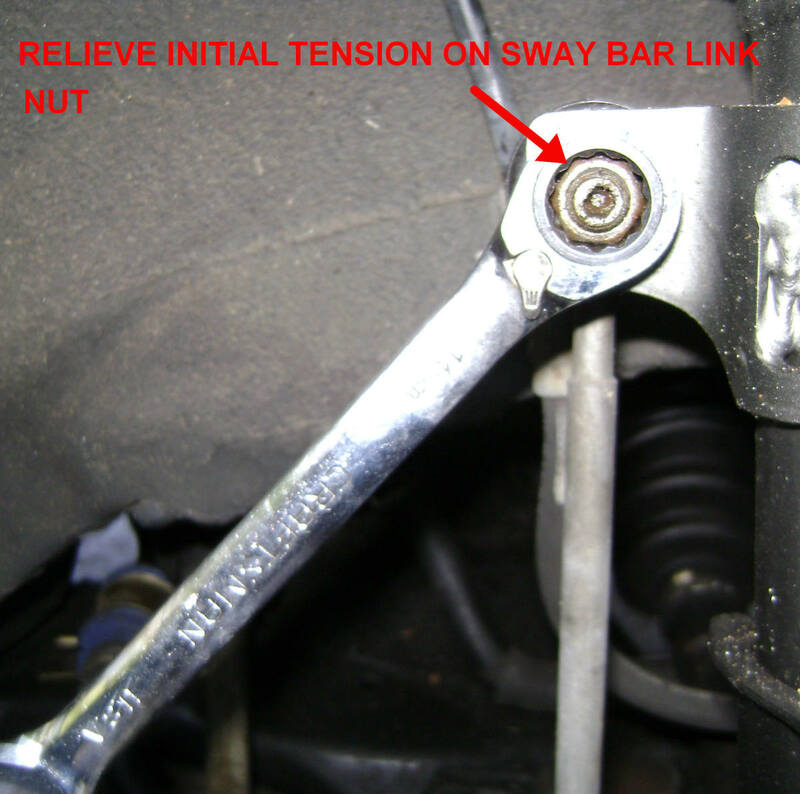 Apply constant pressure on the sway bar bolt. 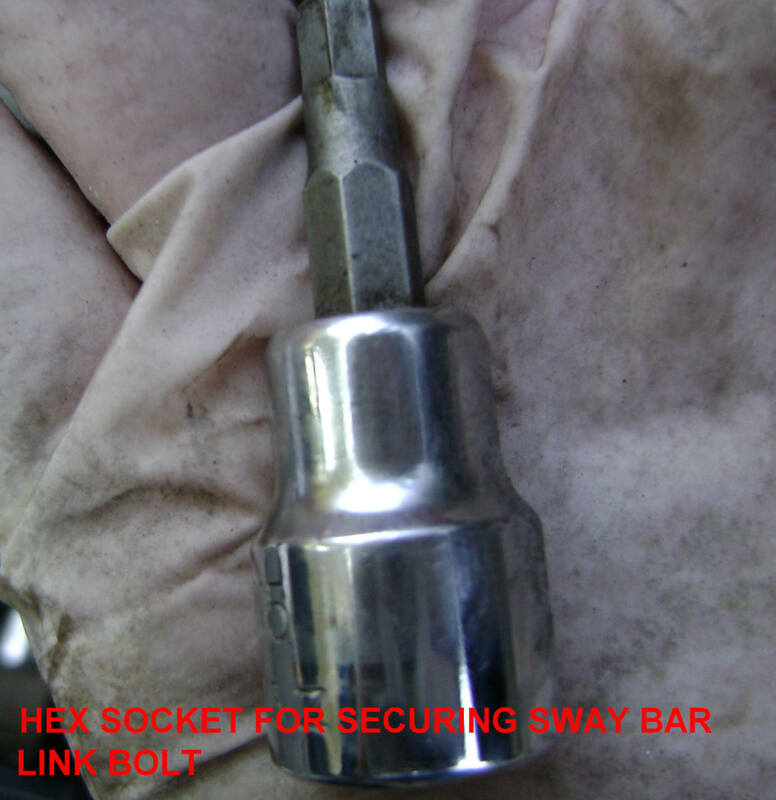 If the hex socket spins inside the bolt, the sway bar link will have to be cut off and replaced with a new one. 5. 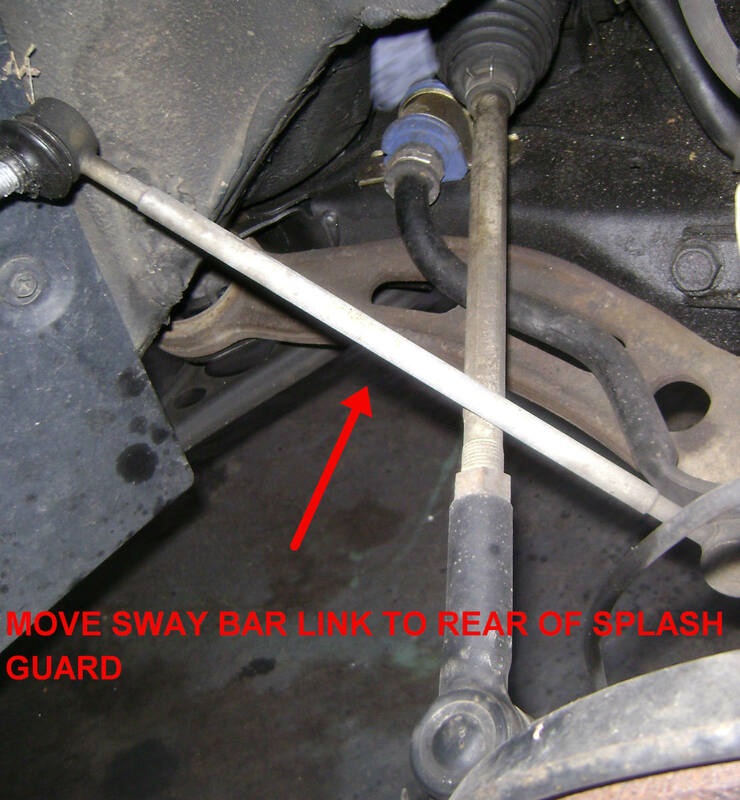 Position the sway bar link away from the strut assembly; push it to the rear of the splash guard. Removing the strut-to-steering knuckle bolts, brake line bolt, and ABS clip. 6. 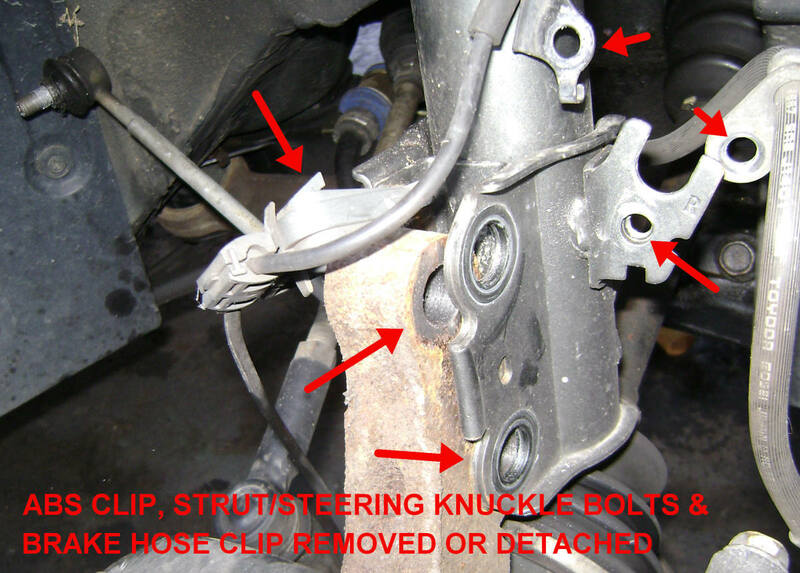 After the strut-to-steering knuckle bolts have been removed, rock the knuckle assembly back and forth until it separates from the strut assembly. Applying some penetrating oil can ease the process. 7. Remove the strut mount nuts. If you don't have a helper, hold the strut assembly with one hand while removing the last nut with your other hand. Warning: For the next step, do not use cheap spring compressors, like those that go for $15 or less. Typical three-finger compressors tend to slip off when tension is applied and the bolt threads wear very quickly. 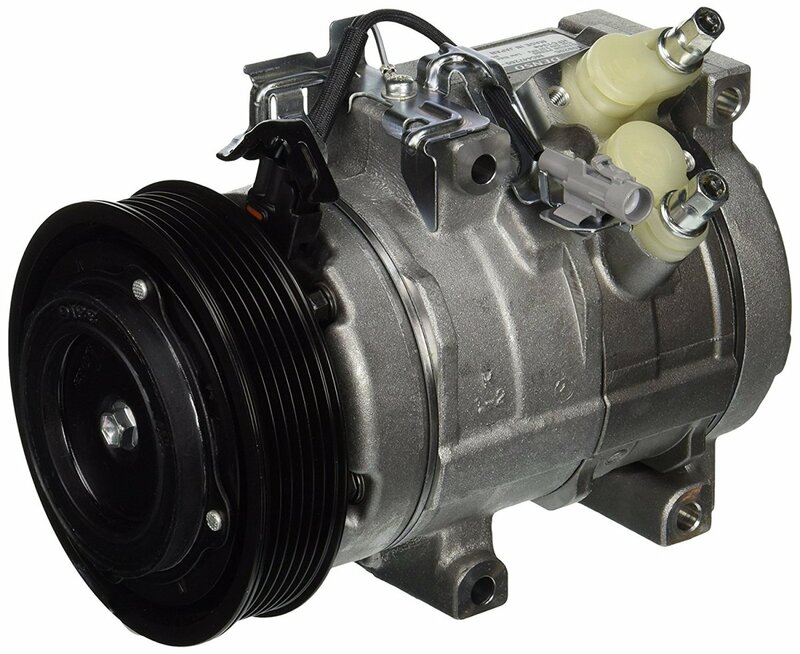 Good quality compressors can be rented from O'Reilly's for free; from AutoZone, for around $10 a day. These are the best spring compressors on the market. 8. 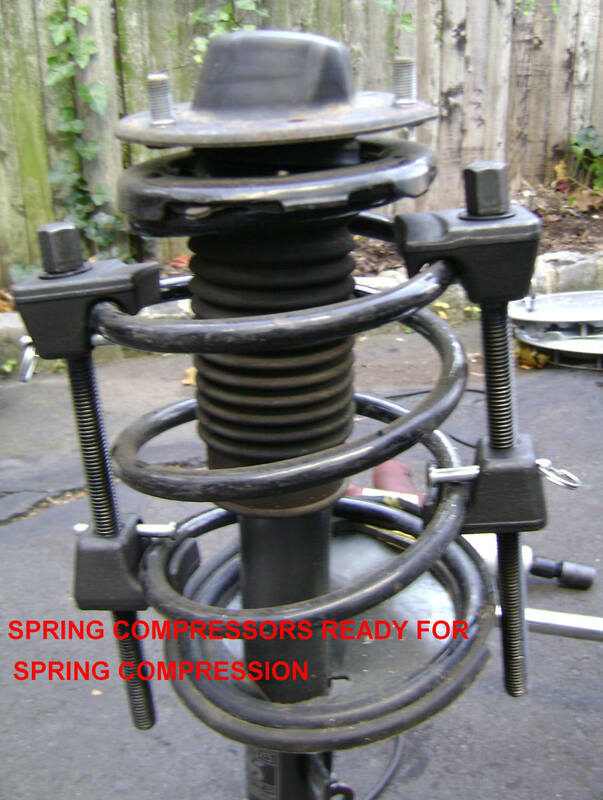 Mount the spring compressors. 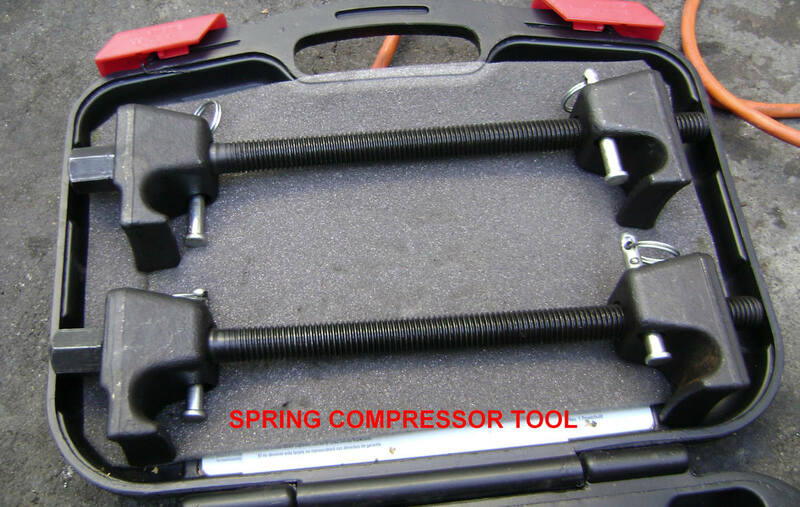 Ensure that the spring compressors are mounted opposite of each other and there is enough room to attach a socket on the compressor's bolt head. Position the spring compressor about one and one-fourth coil turns up from the base. Position the spring compressor about one and one-fourth coil turns up from the base. 9. Apply equal turns on the spring compressor bolt heads. 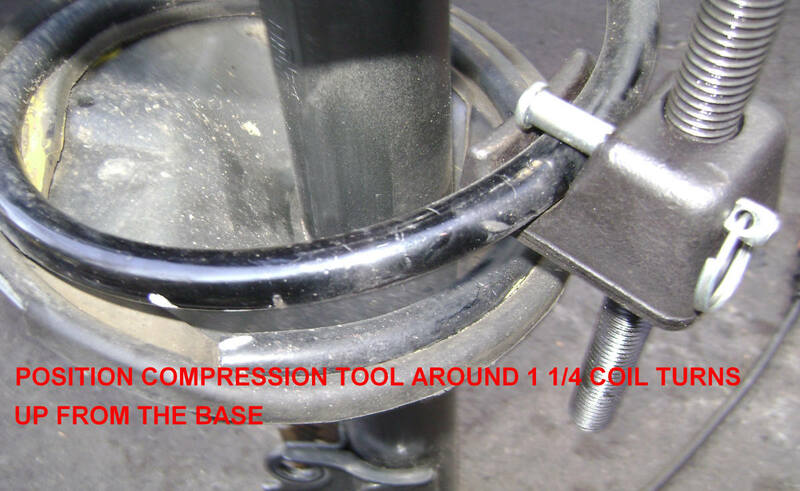 If one side has more compression than the other, the compression bolt will tilt into the bottom strut spring mount. An electric or air-powered impact driver connected to a socket extension will make the compression process go faster. Continue compressing the springs until you can turn the strut mount by hand. When all tension is relieved on the strut mount, there may be only an inch of thread left on the spring compressor bolt. 10. Use an impact driver to spin off the nut that secures the strut mount to the strut stem. Otherwise, the upper mount must be held firmly in place while attempting to remove the nut with a socket wrench. In anticipation of this problem, remove the initial tension on this nut with a 1/4 turn BEFORE removing the strut assembly from the car. 11. 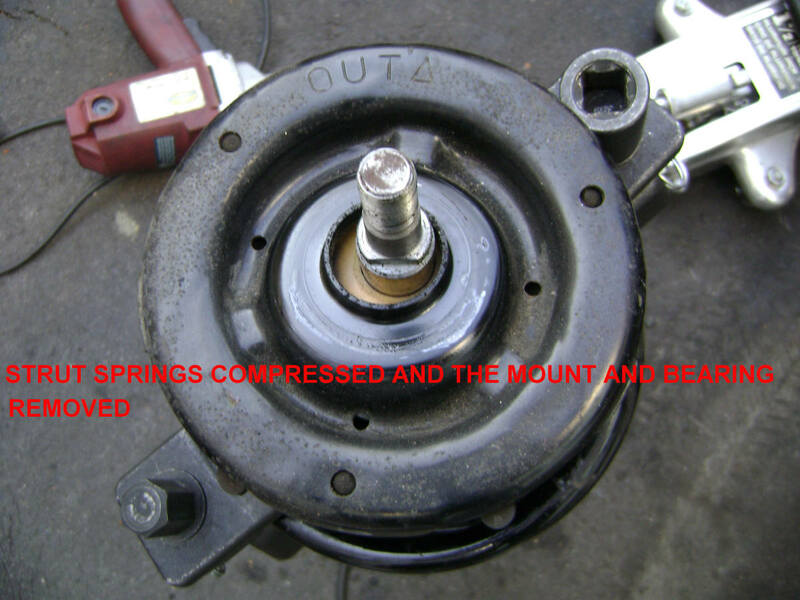 If you are replacing the strut as well as the mount, remove the spring with the attached spring compressors. 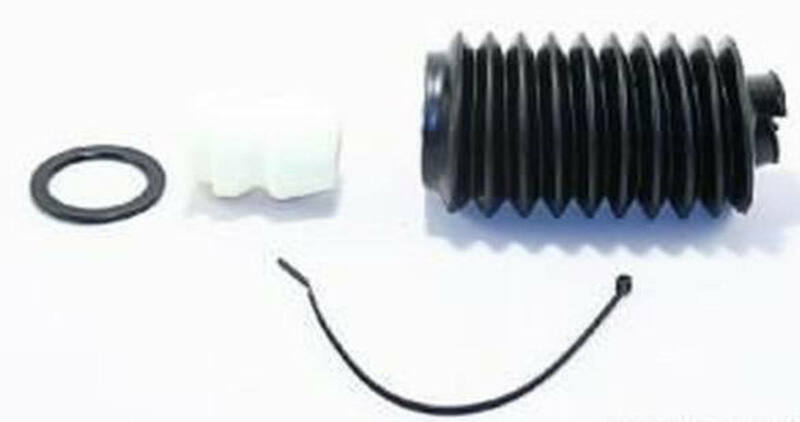 Remove the upper spring mount and rubber mount and bellows first, then remove the spring and lower spring insulator. You can apply paint marks to all removed components to help with re-alignment and re-assembly. 12. When attaching the new strut mount, ensure that the alignment groove in the mount matches the grove on the strut stem. When they are in alignment, the mount will spin the stem. 13. If this alignment cannot be achieved, you may have to compress the strut spring some more to allow the strut stem to rise and stay above the upper spring mount. Finger-tighten the strut stem nut and then tighten it a little more with a quick blip from your impact driver. 14. 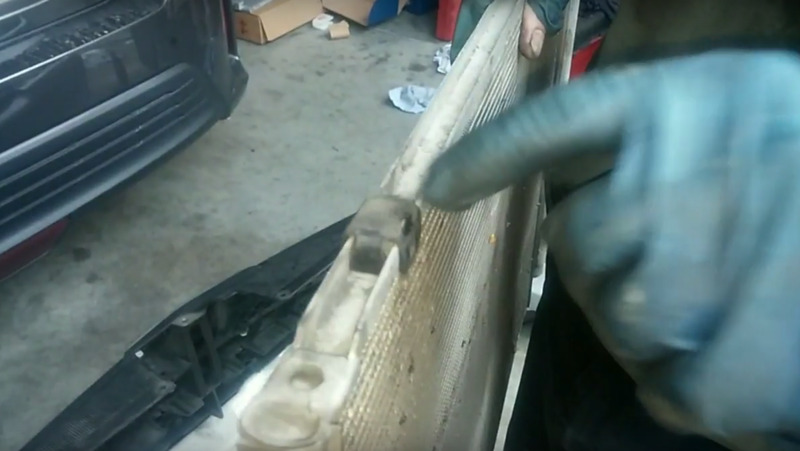 To remove the spring tensioners, apply equal relief tension on the tensioner bolts until the upper spring seat pushes up against the strut mount. Do not allow the spring to be displaced during this process. 15. Carefully position the strut assembly into the strut assembly body mount. Ensure that the ABS and brake lines are in their proper position. 16. Hand-tighten the three strut mount bolts. When the strut assembly is properly positioned, tighten the strut mount bolts. 17. 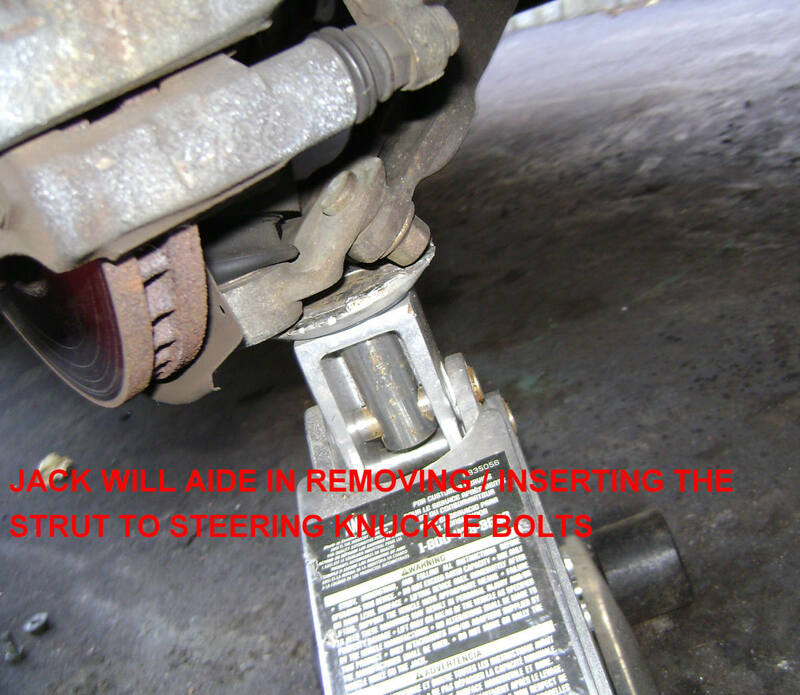 When attaching the strut assembly to the steering knuckle, use a hydraulic jack to lift the steering knuckle into the strut assembly. With some nudging, the knuckle will slip into the assembly. 18. Now, use the hydraulic jack to lift and lower the knuckle until the strut to steering knuckle bolt hole alignment is achieved, and push, twist, and nudge the bolts through the holes. 19. Apply anti-seize lubricant to all bolt threads, if you plan to ever disassemble the struts again. 20. Tighten the strut nuts, connect and tighten the brake line and ABS brake bracket bolt, attach the ABS plastic bracket to the strut connecting holes, and connect the sway bar link bolt to the strut and secure the locking nut. 21. Double-check all your work. Ensure all nuts are securely fastened. No front-end alignment is necessary after this work. If front-end noise still exists after the mounts and struts have been replaced, check the condition of the sway bar links, sway bar bushings, control arm bushings, and lower ball joints. Torn rubber dust covers on the sway bar links or ball joints indicate that these parts need to be replaced (because the grease that lubricates them has likely been lost). It is recommended that they be replaced in pairs. Sway bar bushings may be considered worn out when the bar can be moved in and out within the bushing(s) when pushed and pulled by hand. Replacement of these items will result in a noticeable improvement in handling and ride quality. Are Monroe struts ok to use instead of Toyota brand? In the past, I've had nothing but good results with the performance of Monroe struts. Lately, though, I think their quality may be questionable. Had to return two new struts that were either leaking oil or the gas had leaked out. I was surprised. If you want guaranteed quality, but they're a little pricey, you can go with KYB struts. KYB is a Toyota shock and strut supplier. Smoke coming from under the hood? Coolant or engine oil smoke? For a coolant leak, perform a pressure test (you'll have to buy a kit). For an oil leak, check the valve cover and oil pan gaskets ... either way, for engine oil to smoke, it has to leak onto something in the exhaust system. $20 to $30 an hour is pretty cheap when most shops are charging over $85. You should be charging around $50 if you are really doing quality work and backup your work (which means you'll have to work for free to fix something you may have screwed up or used substandard parts that failed). Mexican run shops (and these guys are pretty good) charge around $50+ and they're generally located in the "hood". I let these guys do big jobs where I don't have the equipment or time (like engine/transmission swaps & clutch replacements). If you think $50 is too much, think of the cost of investing in tools, time in researching the repair, time spent going to the customer's home and possible free repair to stand behind your work. For example, I had to redo a timing belt/water pump repair to address 2 problems: 1. New camshaft seal leaked 2. New water pump seal leaked. In spite of the failure, cost of new replacement parts and the free subsequent repair, the customer still refers me to other new customers. Bottom line: I didn't run away from my work and chalked it up as a lesson learned ... don't use cheap parts. If worried about parts failing, then let the customer pick and provide the part. That way if it fails, it's the customer's fault and he pays for the labor. If you provide the parts, you have to put a price mark up to cover your time and effort in getting the part(s). Compare the part price obtained on-line with local retail parts shops. On-line is always cheaper. The difference in price is your profit margin on the part. the torque is 50 ft lbs on the upper three bolts, 156 ft lbs on the two knuckle bolts, and 20 ft for the break line. I am an aviation technician and I am having trouble figuring out why my engine is smoking under the hood, I've replaced the timing belt, water pump, retimed and checked for oil and water leaks by visual inspection. I do not have any water or oil leaks that I can see any suggestions? I also have been buying older cars and trucks in the 90's age range to fix up and resell for higher to pay for my schooling, I also do some work on the side for 20-30 an hour and was curious if that sounded like a good price for someone who is starting out but still has a good understanding on how to do the job right the first time. The first number on the diagram, I assume, would be lbs. On nuts and bolts on these type of parts, I torque by feel. Hi hardlymoving, thank you very much again for your time and attention. I'll have to go look for another strut mount to settle it. I like my Camry very much, the only issue with an older car is the availability of good original parts. Otherwise, it is almost flawless......at least for me. Thank you again and have a pleasant evening. 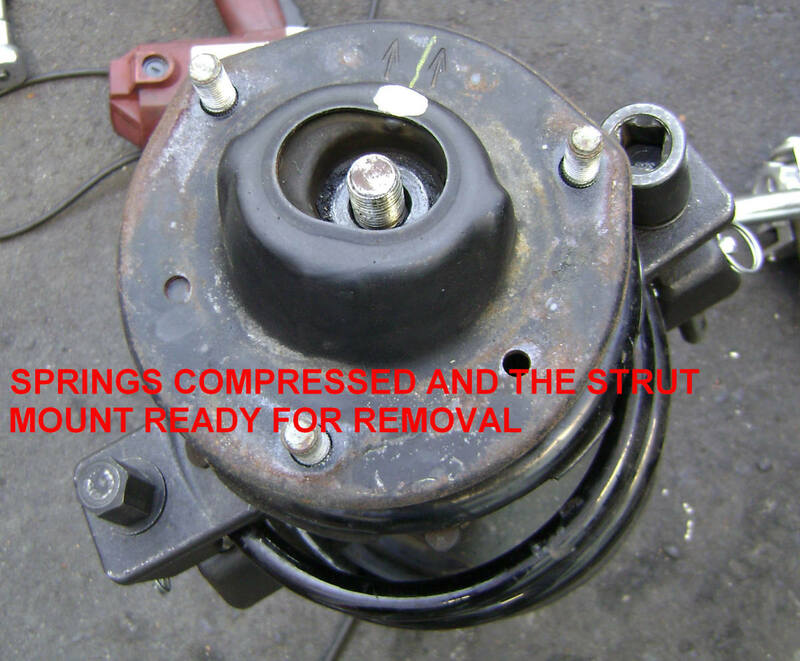 Its the strut mount ... especially when the noise gets louder when the weather gets cooler. And it appears that the mechanic may have installed the incorrect mount but won't admit it. I tell all my junior mechanics to honor their work ... if that means spending time for free to fix a problem they could have avoided if they had the correct part or didn't rushed to get the job done. This is a problem in the auto repair industry where many are paid by the job and not by the hour (that is hasty work is rewarded with more $$$). The 'Rack' problem (i.e. Rack and Pinion Steering) sounds like total B.S. He wants to point you to a non existent problem to pay for his time to fix the real problem. Hi hardlymoving, sorry about the confusion. 5 years ago, I only changed the strut mounts, the struts were still ok then, and the sound was instantly fixed. This time, for the sake of confirming my suspicion, I first changed the strut mount of the front right. Then found the sound is still there, though a little lesser. It is actually about time to change the struts, so I changed to the Tokico. On front left, it is new strut with old mount, no problem. On front right, it is new strut with new mount, the sound become louder and clearer, especially when the ambient temperature is cooler. It become less noticeable after driving around for a while. I checked with the mechanic again last week, he said he will check on the drive rack next time I send in the car, is it possible the drive rack could cause such sound? Your expertise and patient is much appreciated. I a little confused. You first stated that the noise was fixed 5 years ago by replacing the strut mounts. Then you recent post stated that new Tokico struts where replaced a few months ago. If the 5 year old mounts were transferred to the new struts, then I would assume that your mount(s) have worn out. Also, I don't know how the new struts were installed. 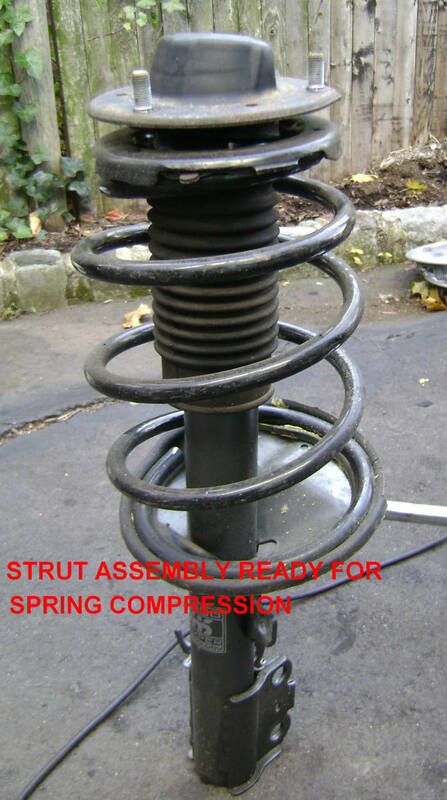 If the struts had worn Spring Bumpers, that can ruin struts quickly. Tokico are expensive, high quality struts with an excellent warranty. I would go back to the tech who installed the struts and have him look into fixing the problem. hardlymoving, thank you very much for the prompt attention!! I'm quite uncomfortable about the offset but the problem is I'm still not able to locate another new strut mount that is exactly same as the old one. The spare part guy keep saying that new one I have suit all Camry 97~01. Actually all my 4 struts are still new, I changed to Tokico about 3 months ago. All are fine except the front right. An offset of 1/2" is a lot. I believe that much of an offset could have stressed the strut to failure; hence the suspension noise. In addition, since the mounts were replaced 5 years ago, the struts may have worn out from regular usage. For the nominal price difference between replacement strut components and a new Complete Strut Assembly (i.e. new mount, spring seat, bearings, spring, bellows), you may be better off replacing you old strut with the new assembly. Labor time should be less than one hour compared to spring and component transfer to the new strut. hi hardlymoving, I have this front suspension noise 5 years ago and the problem was solved after the replacement of both strut mounts. Few months ago, similar sound came back on the right side, I changed the strut mount again, the sound became lesser. Then I changed the strut, and the sound came back especially in the early morning. I also had the sway bar bushing replaced in the troubleshooting process. The mechanic had checked the sway bar link and lower arm and nothing else seem to be loose. One thing about the new strut mount is that top opening is different from the old one. The old one has oval shape opening like the picture you posted. The new old has round opening like the one on the advertisement link above. The different is that that the center the strut is offset about 1/2 inch compare to the old one. Could this be the problem? I asked the spare part shop and they said the strut mount with oval opening is no longer available. I have later found out that the part that I got is not the "A" grade part, it is "B" grade quality, but it is still brand new, should it caused problem from day one? Please advise......and thank you very much for all the good info above. Thanks for the great write up and pictures. I needed the struts and mount replaced and all the soft parts were destroyed so I used a KYB Strut plus assembly that replaces everything as a unit. I needed to use a brass drift to remove one of the knuckle bolts but the rest slid out easy. I didn't understand at first that the sway bar link bolt is "screwed into" the nut and out the back. Handling is improved and the "knocks" with every minor road imperfection are gone. 185,000 miles and I got two unsolicited offers to buy my car this week. Thanks. Problem with Technical Manuals are they tend be too general and don't anticipate small problems that can be be extremely timing consuming to resolve. BEST how to on the net. Period. Well done. Yes ... I've replaced Monroe struts. They're all made in China so I buy cheaper ones off of ebay. My 1997 Camry started making a loud noise recently, and I now know what it is! The stem should not be touching the hood at all. There should be ample clearance. The rubber inside the mount, when it's worn, is causing the rattling noise that may be giving the impression that it's rattling against the hood. Thanks Earnest for the feedback! Brilliant! This is the type of help people need! With your description and photos I could train my dog to replace a strut and suspension support! Well written, great photos and a very worthwhile hub. I gave it a thumbs up and useful.